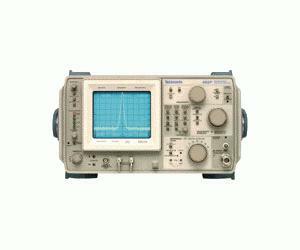 The Tektronix 492P Portable Spectrum Analyzer is a high performance, rugged, instrument of compact size, with microprocessor logic control. Full programmability via GPIB compatibility. Three-knob operation provides use as simple as 1,2,3 through microprocessor coupled functions such as resolution bandwidth, video bandwidth, sweep time, frequency span, RF attenuation, and reference level. The instrument has a resolution bandwidth of 1MHz to 1kHz in decade steps, plus an autoposition. Resolution is within 20% of selected bandwidth.